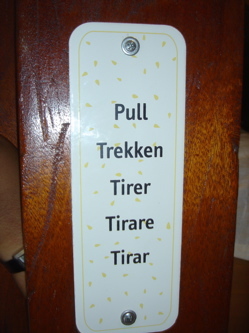 This is the PULL THE DOOR sign from the local Pain Quotidien organic bakery and cafe. Even though an illiterate person has at least a fifty fifty chance of getting through this door on the first try, the sign on the door serves a valuable purpose. It tells a story about the attitude of management, a story that fits the worldview of many that would choose to come.